This will be my third March in as many years. I will be one of scores hundreds of thousands who have descended on the Nation’s Capital. Why? Why do so very many come? What’s in it for them? The women here repudiate their “right” to kill their unborn children. The teenagers who literally have overrun the hotels here repudiate their right to the escape hatch available to them should they get pregnant. The youth are here in roughly equal numbers of young men and young women. I’ve been approaching them all day today and asking why they are here. They find abortion hateful. The boys feel that there is nothing more disrespectful of a girl than asking her to abort her baby. These young people want that escape hatch welded shut, knowing their options should they fall. Leading the line of march are the mothers and fathers who have had abortions. They can be seen in the photo with the black and white signs. Who better to lead us to the Supreme Court than those mothers who shake with anger, some with rage at the monstrous lies told them about the ‘blob of tissue’ to be removed from their wombs? They know. When they reach the summit, the steps of the Supreme Court, the mothers and fathers begin an hours-long series of witness stories. It is raw, brutal, and relentless; the brokenness, the agony, the loss. The terrible, irrevocable loss. We stand with them. We pray them along. We weep with and for them. Most of all, we love them. Brave men and women sharing it all, begging for an end to the killing. Though the killing continues, we’re winning this war. The mothers are the tip of the spear. 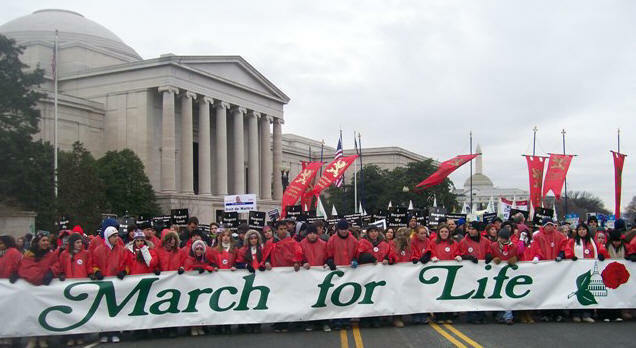 They are backed by advances in imaging technology, by increasing numbers of MD’s and Ph.D.’s willing to tell the truth, by a blogosphere with over 1,000 pro-life blogs willing to disseminate the truth ignored by a completely partisan and corrupt mainstream media. Increasingly our activism is infused by a deeper spirituality and sophisticated and integrated structure. If the healthcare bill is derailed after the loss of Kennedy’s seat, we will have the pro-life community to thank, and Representative Bart Stupak and his coalition of pro-life democrats to thank for holding the line long enough for the loss of a supermajority in the Senate to occur. It looks as though the most rabidly pro-abortion, anti-life President in history has been body-slammed by the American people. God Bless all of you post-abortive mothers and fathers who lead and inspire us by your faithful witness, aided by the prayers of your intercessors before the Father. You’re loved more than you’ll ever know. “When they reach the summit, the steps of the Supreme Court, the mothers and fathers begin an hours-long series of witness stories. It is raw, brutal, and relentless; the brokenness, the agony, the loss. The terrible, irrevocable loss. Those who have had abortions and come to regret it have every right to say so, and to share their painful conclusions with anyone who will listen. However, if they are saying, I wish someone had tied my hands and threatened me with a long prison sentence, I don’t sympathize. We are each free to make choices, we are each responsible for our own choices, we all learn from our mistakes, and the mistakes of others. To the extent they are saying “I was misinformed,” by all means, let’s get all available information out on the table. But this “shaking with anger” line is lurid rhetoric signifying very little. Finally, the two paragraphs above “We’re winning” are blatantly mendacious, a criticism I would seldom offer at this site. There are indeed a substantial number of pro-life Democrats, but their point was to get a health care bill passed, without funding abortions, not to delay a bill they supported, until the senate was reconstituted to perhaps reject it wholesale. You do them all a grave dis-service. Finally, we have never had pro-abortion presidents. As John Anderson wisely said, “I’m not for abortion, I’m for freedom of choice.” There is a difference. Any thousands of people marching in Washington flatter themselves almost to the point of a mortal sin to call themselves “the people.” There are another 299 million and some odd hundreds and tens of thousands of us who won’t be there. There very well may be post-abortive women reading this post. Would you say this to their face? I would hope not. I know of women who think about their abortion every day and will regret their abortion for the rest of their lives. You are very right! There is a difference, a big difference. 1. By saying “I’m not for abortion”, the speaker is admitting that there’s something wrong with abortion, otherwise they wouldn’t be against it. 2. By saying, “I’m for freedom of choice”, the speaker is contradicting the first part of the sentence. Question: Logically, how can I admit something is wrong & then say that I am in favor of being able to choose it? 3. If the logic of #2 escapes you, try saying this: “I’m not for slavery, I’m for freedom to choose slavery.” Silly, isn’ t it? Actually, its worse than silly…its deadly. As a post-abortive mom, I can tell you that what persons-of- your-convictions are advocating for ( my right to kill my own daughter), makes you & your cohorts just as responsible for her death as I am. There is nothing I have said at this site that I would not say in person to a woman who had had an abortion, and regretted it. I might say a good deal more first. I would not blast an opinion in her face just to hear my own words. I would want to connect, to recognize her integrity and right to make her own decisions about her own life experience, while affirming the integrity of my own view, and the fact that her life experience is not a template for everyone. There are, after all, many women who have had abortions who do not regret it at all. I have no desire either to impose on women who have regrets that there is something wrong with them, nor to impose on women who have no regrets that they should share the sense of shame of those who do. For those two points of view to co-exist in the world is difficult at best. For one woman to say “that was my baby” and another to say of her own abortion “that wasn’t a baby at all” is awfully far apart. But, the fact is, we do live in the same world, and it would be very difficult if we all felt we had to spit in each other’s faces on sight, in order to sustain our own sense of integrity. To say, “I’m not for abortion, I’m for freedom of choice” does not necessarily mean that I think there is anything fundamentally, morally, wrong with abortion. It does set me apart from those who believe there is something inherently good, or liberating, or desirable, about abortion. Like any surgery, it is a difficult choice, and one to be considered very carefully. Unlike other surgeries, it terminates a process that would, if allowed to continue, result in a new human life. There are times when it may be the best option. On the other hand, there is no occasion when slavery is the best option, or even an acceptable option. OR, perhaps you aren’t aware that the 13th amendment prohibits involuntary servitude, EXCEPT as punishment for crime. There are people who advocate abolition of “prison slavery,” and they have a good point. On the other hand, when you take someone’s freedom away, because they have committed a crime, and then tell them, while you are in prison, you must work, you may not be idle … you HAVE decided that slavery is acceptable in some limited circumstances!!! Of course that doesn’t apply to the rest of us, only in certain circumstances. Analogies are dangerous. Every cause should stand on its own merits, not on invidious and facile comparisons to other issues that almost everyone happens to agree on. As a post-abortive mom, are you saying that I can escape responsibility for the death of your daughter only by advocating that in the future, women in the position you were in should have a life prison sentence hanging over them, to spare them the anguish you have suffered? Because I don’t buy that. Just because an act is legal doesn’t make it right. Everything immoral can’t be remedied by making it illegal. If you can tell another woman your experience, and if that persuades her to carry her pregnancy to term, then that is a right each of you own, and nobody should complain or interfere. Roe v. Wade does not, by any means, take that away from you. Others may of course make their own perspective available, and data you may not have emphasized, but the right to speak is yours, and the right to choose is hers. That you cannot see that there’s anything “fundamentally, morally wrong with abortion” is a sad admission indeed. Since you grant me the “right to speak”, let me just say that, if you will honestly watch an ultrasound of a baby in utero, you will see that your position on the fence is untenable because,if you grant parents the right to choose whether to end that life in utero, you must grant anyone the “right to choose” to kill anyone else whenever they deem it necessary. Its not possible for an argument to have logical integrity that ignores reality & science. That argument may have washed 40 years ago but those days are gone. You are on the top of my prayer list! A nation/state lost a war. The victorious leader gives you a option. 2. not become property, and be executed. Which option do you choose, SJ? Slavery still does exist in this world. Stalin was the owner of slave/citizens, and used those slaves to build communist projects, from Kolyma to the Baltic canal. It was the best option which brought wealth to the Union of Socialist Soviet Republic. That “slave wealth” allowed the continuation of the U.S.S.R, which then traded the production of slave labor for materials that allowed them to win WW2. So, would you not allow slave citizens as a “acceptable option”, and lose a war, which leads to your citizens becoming slaves? Etymology of the word “slave”. on January 24, 2010 at 6:08 PM Barbara C.
Here’s the thing. A lot of women choose abortion because it is such an “easy” option, or at least appears to be. They are in a desperate or fearful situation and abortion seems like the simple solution to their problems. They choose it simply because it is available. The age old arguments of “Do you think people should go to jail?” and “Do you want people reverting to back-alley abortions again?” is a minority argument. Before Roe v. Wade most women with an unwanted pregnancy at first just sucked it up, went on with their lives, kept their baby or put it up for adoption with few regrets. When I found out I was pregnant with my third, it was totally unplanned. And it seemed like a pregnancy couldn’t have come at a worse time for a variety of reasons. I was depressed and scared and for a brief 30 seconds abortion crossed my mind. I knew that abortion was completely wrong, but the seeming convenience of it made it a temptation for the briefest moment. We then went through a series of “defect” scares where abortion was brought up by the doctor for consideration; I didn’t even consider abortion for 30 seconds at that point. Then I gave birth to a beautiful and healthy baby girl who has been the greatest joy. Again, though, I think about how many women had abortions (even though in their heart they felt it was wrong) just because they were scared and because they could. Or how many have aborted because of the possibility of a defect when there may not have been a defect at all? How many would worked through their fears as their pregnancy progressed and gone on to have children that they couldn’t imagine living without if abortion wasn’t so easily accessible? Thank you Theresa, I appreciate your prayers, even though you may be praying for my mind to be reshaped in ways I would not presently accept. Prayers, well-intentioned, are always good, and God will mediate them in whatever way God chooses. God has the right to reshape my mind, although nobody else does. He may or may not choose to do so. I cannot “grant” you the right to speak. It is not mine to grant. I merely observed that it is yours. It is, in the first place, given by God, not by me. In this nation, it is protected from human interference by the First Amendment. I have said many times, NARAL does not have a monopoly on free speech. If they stopped acting like any contrary opinion is an infringement on their own rights, this discussion would be much more civil in nature, no matter how far apart the opposing positions. I have seen a few ultrasounds, the ones that get posted on web sites. I have a sense that while the boundary drawn in 1973 was the point of “quickening” or the boundary between 2nd and 3rd trimester, the point was always, is this an independent human life. Gerard, and others here, your co-religionists and political allies, assert that an independent human life exists from the moment a zygote is formed. I disagree, but I will save my detailed reasons for another time. I think it may appropriately be somewhat earlier in the second trimester. The point for me is first, is cognitive, is there a conscious sense of self and recognition of what is happening to and around it, and second to that, perhaps whether it is metabolically independent of the mother. Astran, with all due respect I must say your argument is becoming totally incoherent. The fact that slavery exists says nothing about whether it is morally acceptable, or should be allowed to exist when one has the power to prevent it from continuing. Barbara, the fact that you chose what you considered to be the moral choice, in spite of the “easy” alternatives, speaks volumes for your own integrity. The question of prison or back-alley abortions would be no small thing if the “pro-life” lobby were in a position to pass any laws they desired. It is easily bypassed in today’s debate, because that is not presently feasible. I am firm that the police powers of the state should not be deployed to make this decision FOR a woman. I am quite open to the reports that a woman’s right to full information on this, as any other, invasive medical procedure, has been violated. Provide full information, respect the right of a woman to choose to carry her pregnancy to term, and reserve criminal law to a defined point, probably during the second trimester. It has been noted in another of Gerard’s posts that something like 93% of positive trisomy-21 tests result in abortion. This is presented as an outrage, but is strongly suggests to me that an overwhelming majority of women presented with this option do find abortion an acceptable and appropriate response. So do I. Most of them, I’m sure, went on to have healthy babies in subsequent pregnancies. Many mothers who have babies diagnosed with trisomy-21 state that abortion was presented to them as the ONLY option. In fact, many of the mothers who refused to abort their DS baby, stated that they were never presented with any other option except abortion. They were also given information that was biased against DS. They themselves had to SEEK out, on their own, the information and support needed. Very few of these couples were connected with organizations that might provide support for the other option which of course, is to carry the baby to term. The couples also reported an overall negative attitude towards life with an DS child. I don’t think that one can therefore conclude that these mothers where “comfortable” with aborting their DS child. I think they were never really given all the information so that they could actually make an informed choice and a choice for life. The overwhelming attitude of the doctors towards these women was that their DS baby would be an unbearable burden to their families and that DS children suffer terribly. Pregnancy is a very vulnerable time in a woman’s life. Moralilty is subjective and situational. Are you contending that morals are absolute, and that slavery is one of those absolutes that is accepted by all human beings in present time? Is it better that the U.S.S.R, lost the war by not building up their pre-war economic wealth by slaves? Decisions have to be made when your nation is going to be attacked by a nation which accepts slavery(Germany), and losing that war, or using the economic benefits of your nation’s slave citizens, and winning the war. There is nothing incoherent in the questions asked you, and a intellectual would answer them, since such actions and decisions were made in communist/socialist nations daily. Of course, you believe. by personal emotion that slavery is not acceptable, and a moral issue for you. But, given the fact that slavery exist, and is justified by protecting the sovereignty of a nation is only one justification I have listed. You presented yorself as being informed in early Catholic theology, which is why you were asked; who Yocheved was. Which pertains to slavery and one method that a mother used to cheat slavery or death. That’s the short version of the life of Tertullian. Care to expound on how “holy spiritism” trumps the Pope? Astran, you are getting even more incoherent. It is difficult to frame any response without being dragged into the bed of quicksand formed by your choice of words. Morality is subjective and situational? Really? Are you a closet atheist? I assume you have no objection to anyone who subjectively and situationally considers abortion morally acceptable then? Please slow down, before you tangle yourself up in your own web of words. Gerard would know better. He and I arrive at different conclusions, but there is a consistency of reasoning in what he presents. It is true that the form and to some extent even the moral significance of slavery has differed in time, space, and culture. For example, in the Umayyad Caliphate of Cordoba, slaves served as prime ministers, because the Caliph didn’t trust anyone else, and whole armies were made up of enslaved slavs, again because they would be loyal to their master, exclusive of indigenous political intrigues. Not exactly “Uncle Tom’s Cabin.” But, if you want to draw analogies between slavery and the present topic, you must be precise, and you have not been precise at all. As I said, analogies are generally not very informative. Maybe it would be best to leave analogies to slavery alone, and get back on topic. I did not present myself as an expert on early Christian theology — I doubt there was such a thing as “Catholic” theology until about 500 AD or later, perhaps even 700. I have a reasonable Christian lay person’s overview of some major points. I have no idea who Yocheved was, you have given me no reason to consider him significant, and I am not here trying to win “bonus points.” If you have something significant to say about Yocheved, say on, and I will respond to it. A few decades back I started a pro-life group in a small town. One of my starters was based on the work of a NZ obstetrician named Dr. Patrick Dunn. [I firmly believe in the excellence of pro-life logic but (from experience) understand that most people are guided more by feelings/emotions than they are by rational argumentation.] So Dr. Dunn’s observations were most helpful to me then. They has been all but forgotten since, (but IMO they have profound merit)! He interviewed pregnant women/teens and asked about emotional-feelings during pregnancy. A clearly defined ‘mapping of moods-during-pregnancy’ has some rather startling things that should speak to us even now. Dr. Dunn produced a graph and it showed that there was a deep depressive mood in the period of 8-11 weeks gestation. He further said that fully 80% of all abortions occurred at the time of this 1st-depression. for optic(eye) health and in the 3rd-trimester many organs are finishing their initial growth. Even the use of insulin as a zinc-dependent hormone only becomes active a day before birth. Human colostrum (first milk) is noted for its high zinc levels. Not only is insulin very important for growth, but the immune system (dampened during pregnancy) has to be initiated for an independent life outside the womb. Although there seem to be very few people who make such links, it does seem most people would rather blame another person for being ‘them’ … read ‘bad guys’. I proposed this a few years ago, on this site, but I have yet to hear from ANYONE wishing to do a follow-up. Zinc is also used in puberty besides zits on skin. A pregnant teen will be a shoe-in for such a pattern of pregnancy induced depression-periods. Zinc is a fundamental mineral for body functioning especially fertility, so infertility is often zinc-deficit based. People often bemoan folks like Jerry’s kids and others with genetic conditions. One research team concluded that fully 90% of these defects could be prevented through adequate zinc and vitamin B6 during pregnancy. Want a healthy baby???? this is a recent post on Jill Stanek’s site. Count me in support of offering every pregnant woman free B6 and zinc supplements, and a 7-day waiting period between initiation of supplements before any final decision on abortion. Also supplements in the period after birth. A general sense of depression is no basis to make a serious decision like that, particularly if a simple supplement would leave a woman inclined to let nature take its course. Interestingly enough, when pineapple crops in Hawaii were dying because some nutrient had been exhausted from the soil, it turned out to be zinc that was being exhausted.